Bob is brimming with salvage ideas for his newly remodeled farmhouse. Of the ideas we’ve executed so far, this one is by far the coolest: barn-style doors for the master bedroom. 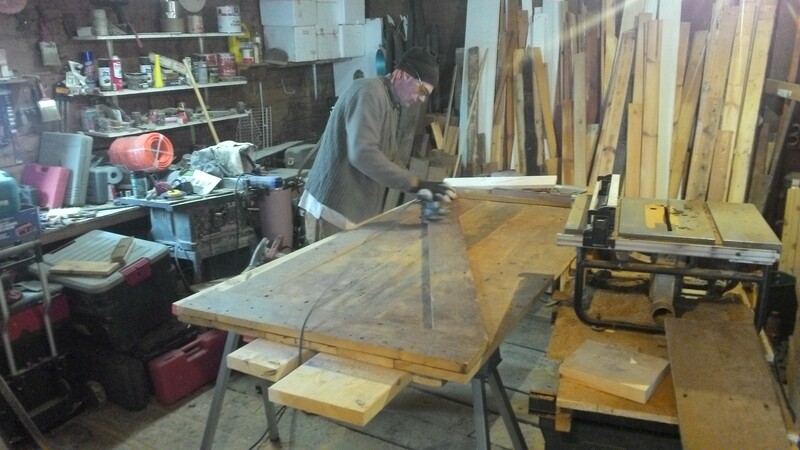 Hans and I are building the doors from scratch, using floorboards from the former upstairs. 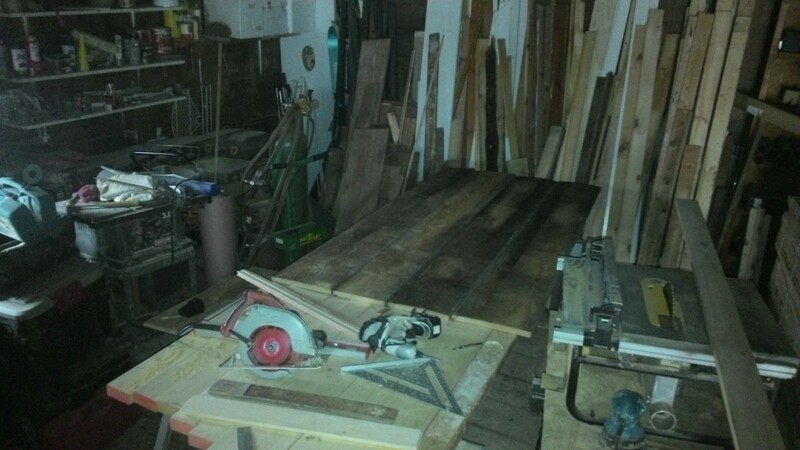 For the first door, Hans found five boards with a combined width that just exceeded the required door width of 40 inches. Then we used a table saw to rip both edges of each board, simultaneously squaring up the corners and reducing the combined width to exactly 40 inches. Hans teased at his artistic side by finding an eye-pleasing arrangement, with a darker board in the middle and a shading effect from one piece to the next. We cut more floorboards to build a Z-brace that holds the five boards together. 1½-inch screws hold the braces to the vertical boards. I buried the screw heads but not too deep, since the boards aren’t much more than ¾ inch thick apiece. Hans ran a sander across the rough side of the door so it wouldn’t be too rough. Working in the barn, Hans sands the Z-brace on the first door. Before we could install the first door, we needed to put up a piece of drywall to fit behind it on the north exterior wall. With Hans’s help, I marked the electrical box locations and cut them out with a keyhole saw, along with notches for the rafters above. 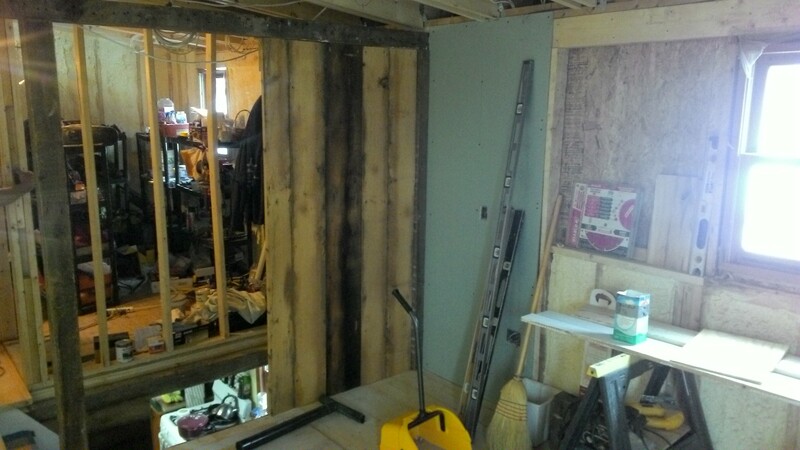 When the wall proved too tight I used a rasp to make the notches a teensy bit bigger. Then we glued and screwed it in place, plumb and flush to the studs. Meanwhile, Mark built two posts and a header for the door assemblies. First (fixed) door installed. Note the header and posts, and new drywall just to the right. The first door is centered under the header and fixed in a T with the north wall. We’ll install the other two barn doors on tracks, one on each side of header. This arrangement will let the doors slide fully open for a feeling of spaciousness (with all three doors pushed to the north wall), fully closed for privacy, or anything in between.